this bird is quite fascinating! 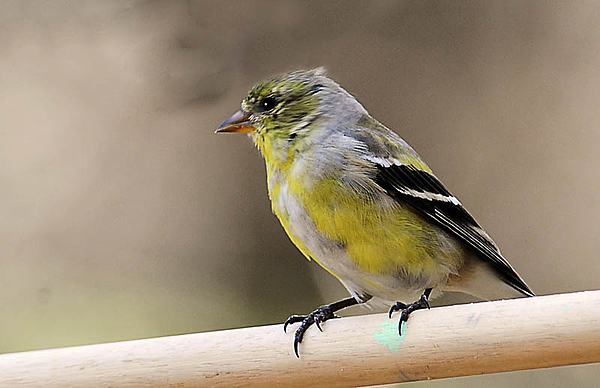 The mottled coloring isn't why though.. American Goldfinches have pinkish orange legs, even the juveniles. Smaller but similar-looking Lesser Goldfinches have black legs, but they are only found in the southwestern states and up the west coast. Was this finch the same size as the other goldfinches? Hmmm!!! Would you mind if I posted this pic to the bird identification thread on birdforum.net? just to see what the experts say about it.